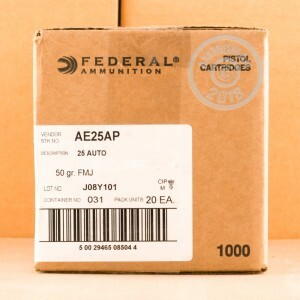 For an ideal range training ammunition for your 25 auto chambered firearm, check out these 50 rounds from Federal! 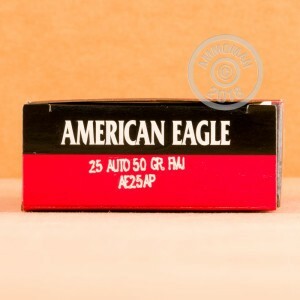 These rounds are a member of Federal's American Eagle line of ammo. Each round contains a 50 grain full metal jacket bullet that hits your target with the accuracy and precision we all expect from Federal. 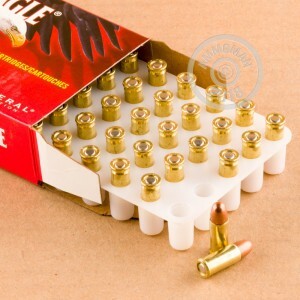 These rounds are boxer primed and brass cased, as well as non-corrosive and reloadable. The clean burning powders will keep your firearm firing like new as you shoot round after round. Federal ammunition is manufactured in Anoka, Minnesota. They were founded in 1922 when Charles L. Horn took control of a small plant in Anoka and refounded Federal Cartridge Corporation. They remain a solid leader in the ammunition industry, producing and selling high quality products worldwide.